broad expertise in the Asian littoral. Her writing has appeared in leading publications including Asian Security, Ocean Development and International Law, Cambridge Review of International Affairs, Foreign Policy and The Diplomat. She has contributed to six major publications, including her edited volume published with Routledge in 2017. China Sea disputes, naval modernization, piracy and other non-traditional challenges. She takes a leading role in DKI APCSS' maritime programming, in Honolulu and around Asia from Vladivostok to Mumbai. Prof. Nankivell came to the DKI APCSS from the Canadian Forces' Pacific Headquarters in Victoria, B.C., where she served on the staff of Commander, Maritime Forces Pacific. She holds a B.A. (University of British Columbia) and MPhil (Cambridge University). Her writing has appeared in leading publications including Asian Security, Asia Pacific Defense Forum, Ocean Development and International Law, Cambridge Review of International Affairs, Journal of the Australian Naval Institute, Canadian Naval Review, Foreign Policy and The Diplomat. She has contributed to major publications: From APEC 2011 to APEC 2012 (2012), Issues for Engagement (2009), Understanding Global Terror (2007), and Why Japan Matters (2005). 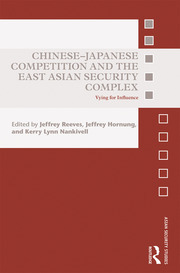 Her first edited volume, Chinese-Japanese Competition in the East Asian Security Complex: Vying for Influence will be released in 2017.